Doctor Who is a world -wide phenomena that has spanned decades. It is produced by the BBC. It is the longest running sci-fi program ever. The story centers around a Time Lord, the last of his kind who can move between time and space with his TARDIS spaceship, which resembles a blue police phone box. He uses the TARDIS to solve problems and battle justice throughout the galaxy. 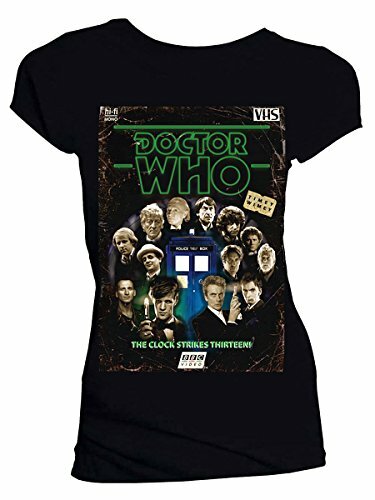 This officially licensed Doctor Who shirt features all 13 doctors on a retro VHS cover. Made of 100% cotton.